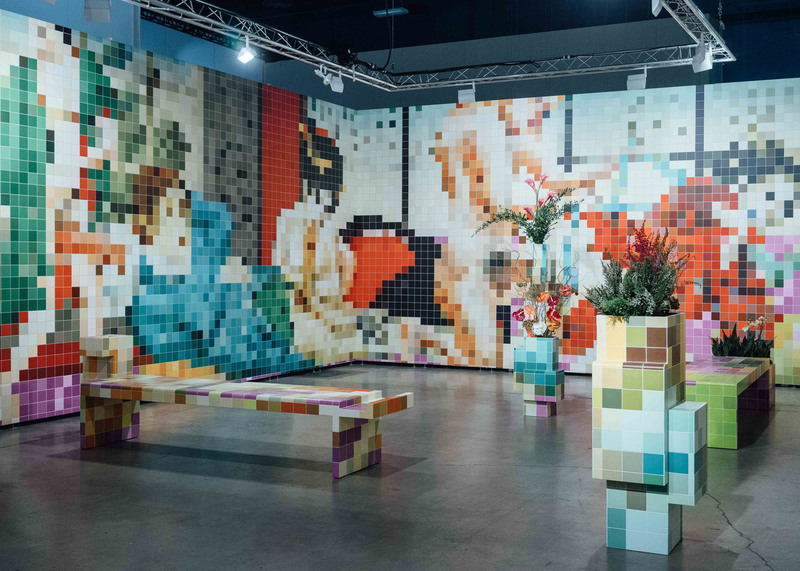 German artist Tobias Rehberger has used colourful tiles to create pornographic mosaics inside a booth at Art Basel Miami Beach. Presented by Swiss museum Fondation Beyeler, the installation is titled 1661-1910 from Nagasaki, Meiji, Setti. "By virtue of their colours and forms, various objects placed around the room are integral components of the mural," said Fondation Beyeler. "The objects concerned are vases, benches and an ashtray in a camouflage technique that project the mural out into space." The piece was originally installed at Fondation Beyeler's gallery close to Basel earlier this year, but is now on show at the Art Basel Miami Beach fair. Also for this year's event, which runs from 3 to 6 December 2015, Snarkitecture has covered a private jet at Miami International Airport with a sky-blue gradient. Rehberger is best known for his patterned black and white installations, and has previously covered a replica of his favourite Frankfurt bar in bold geometric stripes. He also used dazzle camouflage – a technique for disguising battleships with distorting graphics – to decorate the HMS President in London to mark last year's centenary of the First World War. Photography is by Marco Andres Argüello.